Anthropologists, historians, and sociologists will find here a striking challenge to accepted explanations of the northward movement of migrants from Mexico into the United States. 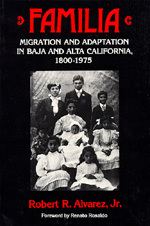 Alvarez investigates the life histories of pioneer migrants and their offspring, finding a human dimension to migration which centers on the family. Spanish, American, and English exploits paved the way for exchange between Baja and Alta California. Alvarez shows how cultural stability actually increased as migrants settled in new locations, bringing their common values and memories with them. Robert R. Alvarez, Jr. is Associate Professor of Anthropology at Arizona State University.